Your garden can be used for much more than just sitting in! t would be wrong to take up the whole garden with a muddy 'farm'. Everyone needs their bit of space, a little hideaway to sit, dream and contemplate. Pallets (and there's enough of them laying around) make ideal material for garden tables and benches. Often only a little sawing is required as the sizes are often about right for a one person or two person bench / table. Raised beds can also be made with wood from pallets and elsewhere. Raised beds are easier to work with and separate the sections of your plants better. The only negative is that slugs like borders of wood, so be aware of that and keep an eye on your yound seedlings. 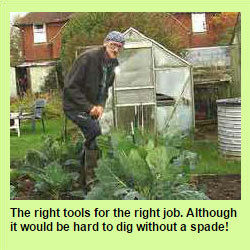 Some garden tools cannot be skimped over by using cheap or second hand items. It is imperative you have a good mower, strimmer, spade and fork. You can easily pick up the lesser tools at boot fairs and auctions. Again, it's good to set these things up before you downshift, you don't know what unexpected overhead is going to suddenly loom up. The Garden Shed is going to become not the place where you just chuck everything in to get it out of sight. The more storage and dry working space you have, the better. Sheds can be obtained at reasonable prices by looking around, or you may consider building your own. Sometimes people are chucking their old sheds away, a bit worn maybe, but if it does the job and you don't want a Swiss Chalet outside, it will suffice. Try and have two sheds, one for storage and one for working in where you have good shelving and work tops. Garden sheds are prone to theft, so bare that in mind. A good investment would be to secure some sort of burglar alarm or deterrant. Following two thefts in my tool sheds, I purchased a small camera which I have linked into my TV. I also have a PIR light which when set off presents the view of a 'CCTV' sign to the intruder. I live in a fairly rural situation and are prone to cars driving around slowly having a peep, so anything like this is well worth it. The camera cost me £30. If you're in no rush, simple looking around at other peoples rubbish (!!) will get your brain into thinking 'what could I do with that'. long bits of wood become climbing rose arches, baths become small ponds or water butts, old toilets and sinks become 'features' for growing in. Whatever you do, it doesn't have to look like some old tatty uncared for place. A little thought and a good imagination will give you loads of ideas. Cost effectiveness - will buying a more expensive tool last longer ?